Phantom of The Opera comes to Cadillac Palace Theatre on Thursday 22nd December 2016! Come and catch the classic Phantom of The Opera in an incredible Broadway production, fit with the most talented actors and vocalists, this is definitely one not to be missed! 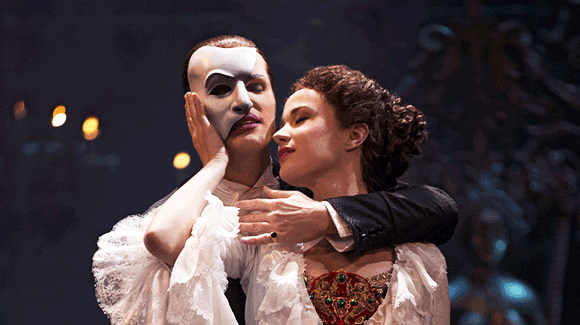 As it tells the tale of a dark fantasy inspired love story between the beautiful Soprano vocalist, Christine and the man who hides behind the mask – the Phantom! "No wonder it's the longest running show on Broadway." Scenic design by Paul Brown, Tony Award®-winning original costume design by Maria Björnson, Lighting design by Tony Award®-winner Paule Constable, new choreography by Scott Ambler, and new staging by director Laurence Connor. And of course wonderful special effects including the legendary chandelier.